Finishing School is an easy, intuitive guide developed by Cary Tennis and Danelle Morton. 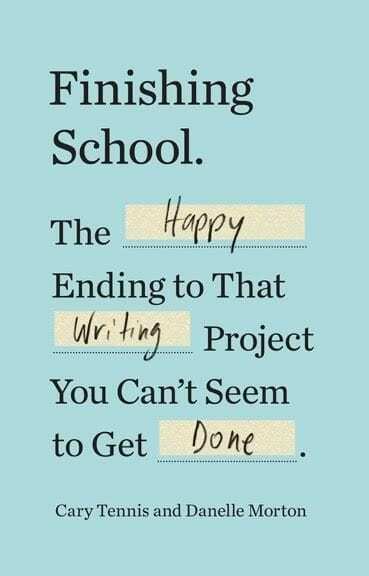 Finishing School workshops bring people together, creating the supportive environment and stability writers need to get those tough-to-work-on projects done. These workshops are helping people across the country share their work and creativity. This is your opportunity to join the St. Louis wave – with Maria as a facilitator! Our group meets April 2019! Come be a part of it all. Each workshop hosts a small group of writers to finish (or launch!) a writing project. The Finishing School workshop will give you the tools and inspiration you need to get back – and stay on – track with anything you’re working on. Here you’ll make real progress, and share your story in a circle of fellow creatives. We’ll talk about the struggles and successes of the writing process and get your ideas on the page. Maria Rodgers O’Rourke is a writer, teacher, and facilitator whose words will inspire you to nurture your talent and get your work done. Like many writers, she knows the struggle of resistance and procrastination, as well as the joy of publishing work that readers appreciate. Having completed Finishing School herself, Maria knowingly and carefully guides participators with a deep understanding of the writing process. Read what she learned in Montana, when she lugged a pile of notebooks across the country in search of her own writer’s voice. Let's Finish your work... together! Our online Finishing School workshop will meet Monday evenings, 6:30 – 8:30 p.m. If you are interested in joining a group, but these times are not workable for you, please contact Maria.